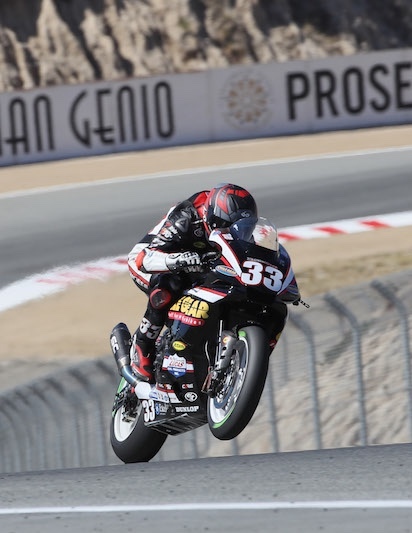 MONTEREY, Calif. (June 26) — The Cycle Gear-sponsored KWR team found top ten results again this weekend at WeatherTech Raceway Laguna Seca for the fifth round of the MotoAmerica Championship. Kyle Wyman earned 9th/7th place finishes in Superbike while Bryce Prince earned a 7th spot in his sole Supersport race of the weekend. For Wyman, the weekend was hindered in part by a lingering injury from a motocross accident the weekend before, where he sustained two broken ribs. The Superbiker fought through to match his best qualifying result of the season, 7th, on Saturday morning before race one. Wyman got a great start in the first race and found himself in 4th place into turn one, but was quickly swallowed up after struggling with rear grip on his Cycle Gear/KWR Yamaha. He dropped to 9th place and rode a lonely 23 laps in for the checkers. After his 9th place finish, the KWR team made adjustments to the geometry and his K-Tech Suspension for the morning warm-up. Wyman clicked off his quickest race-tire time that morning, and did it with ease. In race two Wyman had another good start – up to 5th spot on the first lap. He was shuffled back to 9th, but was able to fight forward to climb back up to 7th. A positive result in race two for the KWR team proves they are back on the right path. Next up on Wyman’s calendar is something a bit different from racing motorcycles. Kyle Wyman will marry his fiancée and beIN Sports Pit Reporter Hannah Lopa on July 7th, 2018 before the sixth round of the MotoAmerica championship. The next round of the MotoAmerica championship is at Utah Motorsports Campus in Tooele, Utah July 20-22, 2018. Stay tuned on the @kylewyman and @kwr_sbkInstagram pages to check in on the team’s progress. 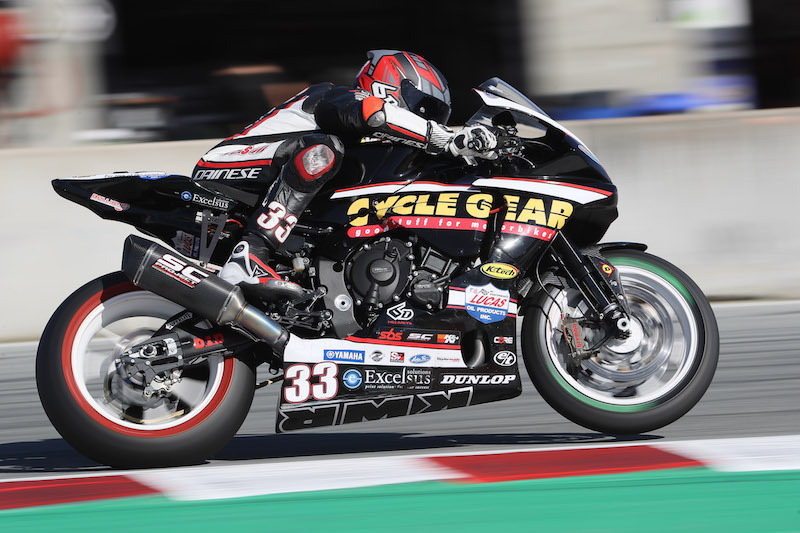 The KWR team would like to extend its gratitude to Cycle Gear, for title sponsoring the team for the Laguna Seca round. Click Here for Kyle’s Video Interview with Cycle Gear!